The famous Irish film was ‘ Into the West’ but for the riders in the International Kerry Group Ras Mumhan Day 1 will once again see the peloton head into East Kerry on Good Friday April 14th. Over 200 riders from a number of countries will start the 2017 Kerry Group Ras, and the quest for the Donal McKenna Cup, by taking on the traditional 100km loop starting and finishing in Killorglin. This is the first of four days of top class racing covering 500km of the best of Kerry and West Limerick stages. There are very few more exciting s sights in sport than that of a cycle race at full speed. Added to this is the cavalcade before and after the riders with the team and officials cars make is a sight that everyone should come out and witness as it races past. Viewing Points: Stage 1, sponsored by O’Sullivan Cycles Killarney, takes in a lot of the Sliabh Luachra area but the riders will have no time to listen to any traditional music as this is a fast stage. Starting off in the town of host club Killorglin CC the riders begin on the main road as they head towards Killarney. If they can get a tail wind they will be moving as they head in through Fossa and towards the two quick roundabouts at Ballydowney and at Lidl. There are lots of good viewing points along this part of the route including on the Hans Liebherr Road or at Cleeny as the riders turn onto the Tralee Road for a short bit until they swing right by the New Cemetery and head for Kilcummin. 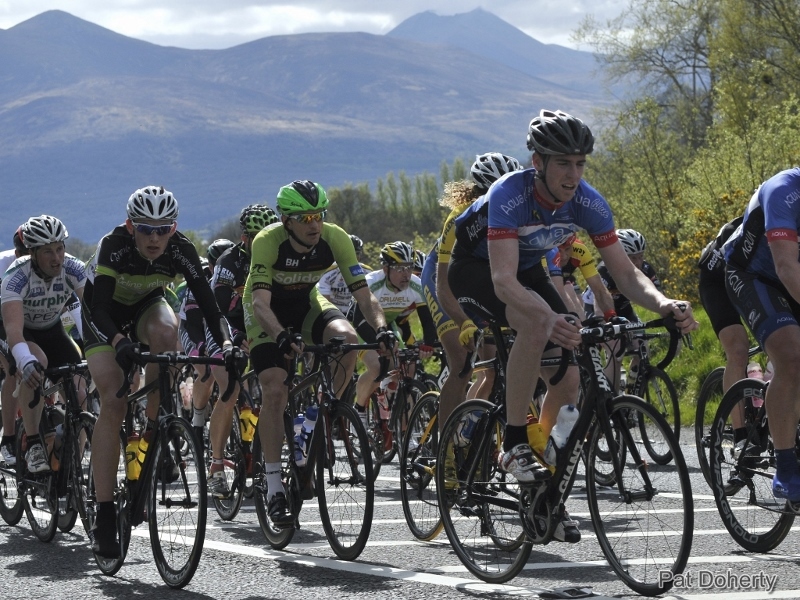 The village is always a busy viewing area, especially for those who want to make it back to Killorglin for the finish. If the roads were fast from Killorglin to Killarney they race is now on a totally different type of path as they face the undulating roads from Kilcummin to the Scartaglin road. In this section is the only big climb of Day 1 – the Category 2 climb at Knocknaboul so those with ambitions of taking the climbers jersey on Easter Monday will be looking to get across the summit at the head of the race before sitting in and hopefully getting back into the position for the uphill finish in Killorglin. The top of climb at Knocknaboul is one of the best viewing points on the first stage of the Kerry Group Ras Mumhan as the riders are visible from a good distance as they tackle in ‘incline’. The one thing to say about Knocknaboul is that it usually gets the 4 weather seasons in the one day so come prepared! Before that there is a lot of riding to do. 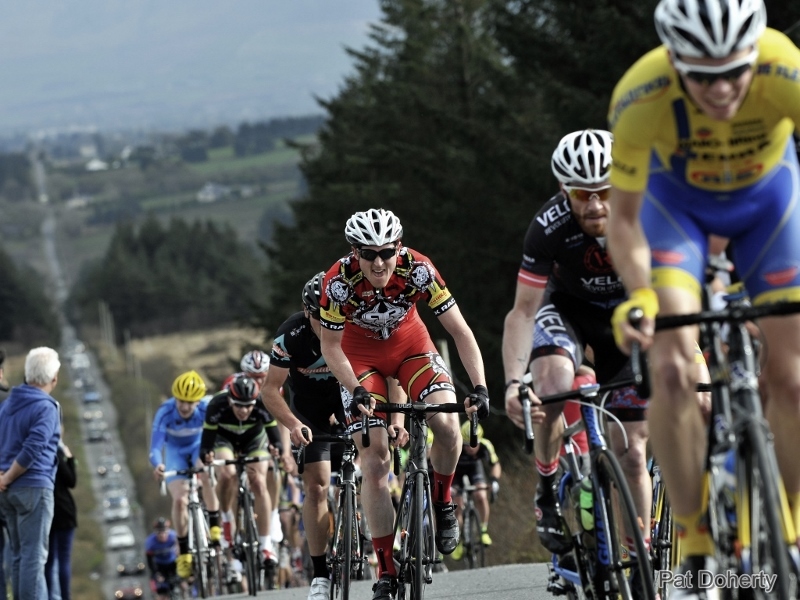 Once the race comes onto the Scartaglin road the pace really picks up as it heads towards Castleisland – with Scartaglin Church and Garveys corner two more viewing spots that always draw the crowds. Heading out of Castleisland the race head to Currans where the speed on the approach to the village needs to be quickly slowed down for the tight turn under the railway bridge and then up the hill and across the Tralee Road overpass. The village of Currans is another good viewing spot but as with all areas where people gather it is vital that the stewards are obeyed as safety is paramount. Once through Currans the riders face a long drag towards Ballyfinnane and back onto the Killorglin road at the far side of Firies. Milltown is up next and the swing through the town always brings out the crowds. (If you are going to Milltown or indeed to any of the towns and villages that the Ras passes through, please be careful where you park your car. The corners and parts of the road are narrow enough without the riders having to navigate round parked vehicles. The climb out of Milltown is one that will test even the best of the riders. While it’s not the longest it’s one of the steepest and comes after roughly 75km of hard racing. Fans will be looking to see what riders are suffering as an indication of who is going well and who is struggling. From Milltown those thinking of stage glory and being in yellow for day two begin to make their moves. To see teams working to get their main men into the right position is one of the most amazing parts of cycling racing. Those leading protagonists will want to be in position well before the tricky finish of Day 1. The downhill section into Killorglin town is fast while the turn at the Fisheries and then the Roundabout must be carefully negotiated. Once onto the bridge its heads down and full pedal to the metal for the sprint up the hill to the finish line. And so ends Day 1 but it is quickly time for R&R as there are 3 more hard days on this wonderful Kerry Group Ras Mumhan. As they say – You can’t win the Ras on Day 1 but you can certainly lose it! 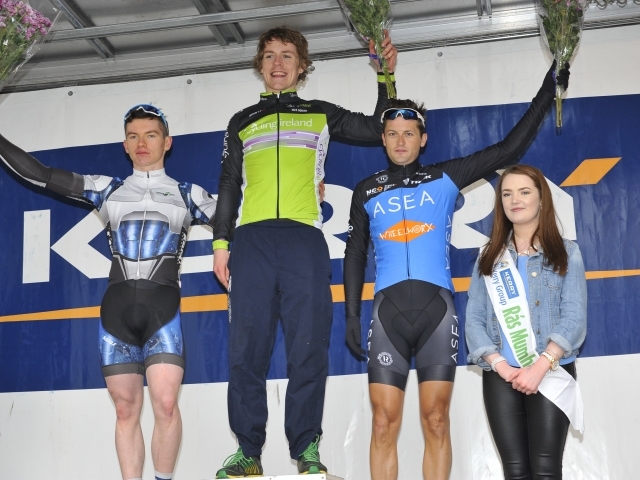 For the record this stage in 2016 was won by Ireland Development Rider Chris McGlinchey with Sean Lacey the best placed Kerry rider in 4th place.